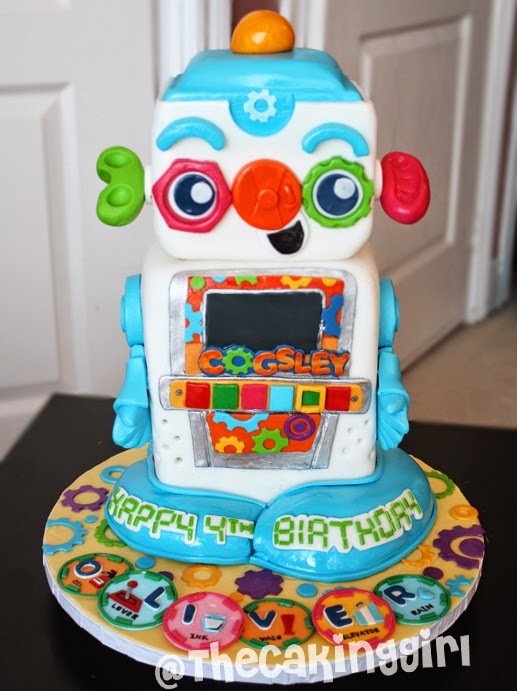 Here's the Cogsley Robot Toy. The most challenging part of making this cake, was support structure. I decided to make the head out of styrofoam, and have all the servings of the cake inside the torso to lessen the weight of the cake. I explain below how I made the support system for inside of the cake. 1. The torso cake is cut in half with a top and bottom. 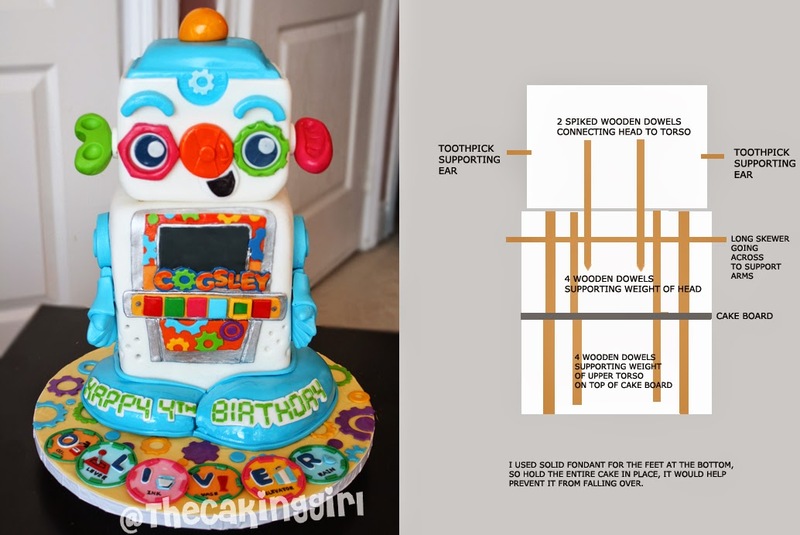 The bottom had 4 wooden dowels cut to the same length, touching the cake board at the bottom, and supporting the smaller rectangular cake board on top that's supporting the top half of the torso cake. 2. The top half of the torso cake also has 4 wooden dowels cut to the same length. The bottom is touching the smaller rectangular cake board, and the top is supporting the styrofoam head. By cutting the torso in half, and putting dowels and cake board inside, you're taking the 'weight' off the cake. 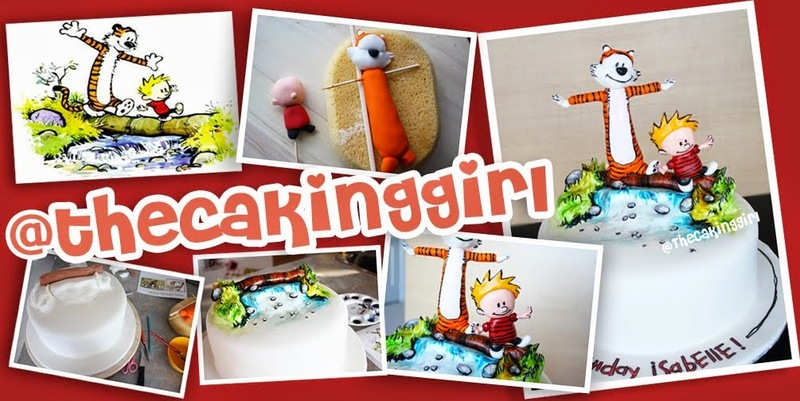 If you're working with a cake taller than 6 or 7 inches, I would suggest to do this. Once the cake is in room temperature again, it'll wobble and move, and it can easily collapse, especially during transportation. This would help reinforce the support. You're creating a 'table-like' support inside. 3. I put 2 dowels through the cake. Half of it is in the cake, and half of it is in the head. This would keep the head in place and prevent it from loosening or falling off. 4. For the arms, it's enough surface area touching the body and if you put edible glue on all of that area, it should hold it in place, but just to make sure, I added a wooden bbq skewer going across the cake. 5. For the ears, I held them up with toothpicks. I used more than 1 toothpick on each side since the ears are quite heavy. I get asked a lot how do I keep fondant pieces up, I always put toothpicks inside. Just let the person cutting the cake know, so they are aware and take them out if they are serving them to kids. 6. I always go for safe.. so after all that support, I made the blue feet out of solid fondant, and wrapped it around the torso. This locked the cake in place really well! I always try touching the cake and slightly pushing it to see if it moves. The cake didn't move after I added the blue fondant feet! It's a long piece of fondant going around the base of the cake like a belt. Awesome post! 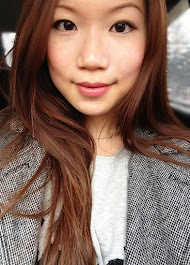 I am first time visit your blog and I'm by and by extremely happy to peruse it. Every one of the things with college paper that you shared here is supreme right. My uncle is additionally work in land division. Also, I am particularly know the estimation of house since I learnt numerous things to my uncle. Back braces for lower back pain can help you get the activity you need ... The following video gives a good overview of how back pain occurs. Inversiontablesselect The best back brace and Support Belt to cure your back pain.